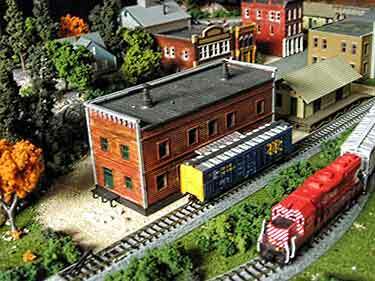 There are at least two ways to continuously enjoy a small layout. You can enjoy it in SPACE—watch it move round and round, endlessly, in a continuous circuit. Or you can enjoy it in TIME—constantly improving it as the weeks and months pass. Here are some excellent examples of both! One great way to add to your minimum space enjoyment is to expand upward—add a second deck, for example. Russ Haigh, from Willoughby, Ohio, USA, expanded his 24x18in On30 mining empire (upper left), the Fiddletown, Copperopolis & Pacific by adding a second-level processing plant served by an On18 subsidiary (upper right). 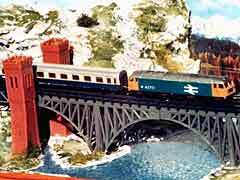 Scenery is mostly paper, as explained in Scrapbook #86. 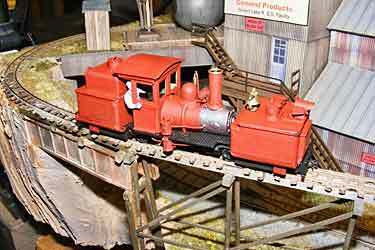 Russ explains, “Lower level track (16.5mm) is Atlas code 83 with alternate ties removed; the upper level (9mm gauge) is Peco HOn30 (HOe).” Russ is currently rebuilding his innovative 18-inch-gauge Garratt (lower left), that originally appeared in Scrapbook #79. 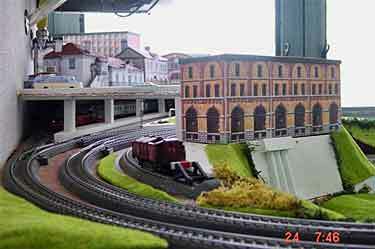 Also working on enhancing spatial enjoyment with a dual-gauge bi-level railroad is Brian Wilson, from Victoria, British Columbia, Canada. 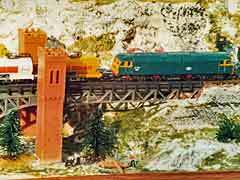 Designed to fit on a 2x4ft (60x120cm) resin table (shown in Scrapbook #85a), Brian’s initial design is at right and features both On30 and On18 trains. The indvidual levels are also shown. 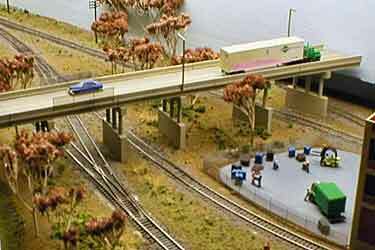 “The main focus for operations will be the loading dock interchange. I can visualize four engines involved in switching cars to and from the loading dock not to mention moving engines to and from the engine service area. A second operational area will be the processing plant on the upper level,” Brian explains. 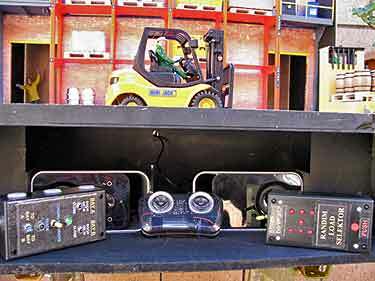 We’ll report progress on this operations-oriented little line as things develop! 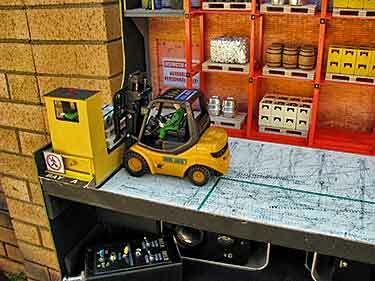 Victor Smith, from Pasadena, California, USA, has added a second deck to his 3x3ft (90x90cm) G-scale pizza layout featured in Scrapbook #79a. 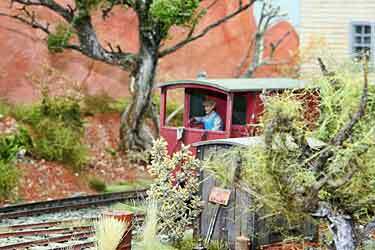 The top level is a new 21in-diameter Aristo-Craft offering, intended for trolleys/trams but navigable by four-wheeled railroad cars and tiny 0-4-0 Casey Jr. locomotives (from Disneyland). 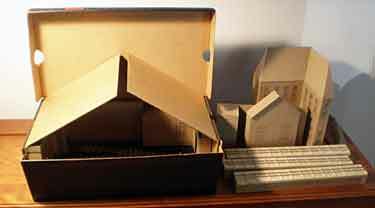 Victor is planning to add a 3x1ft (90x30cm) “town diorama” module that will include a 36in (90 cm) track section to act as a holding/display track for extra trains. Meantime, Victor has made an entertaining video of two trains in action on the existing module. “I still get dizzy watching it!” he says. Click on the arrow below to see the action. 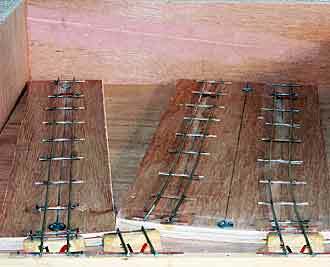 Hennning Stelter, from Lisbon, Portugal, carried his adventures in space to another level by coiling a “folded dogbone” track plan (at right) around his 183x105cm (72x41in) space to provide each train a full-circuit trip of 16m (52.5ft)! 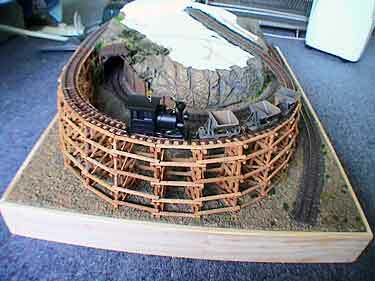 Here are some under-construction photos of Hohlberg (“Hollow Hill”). 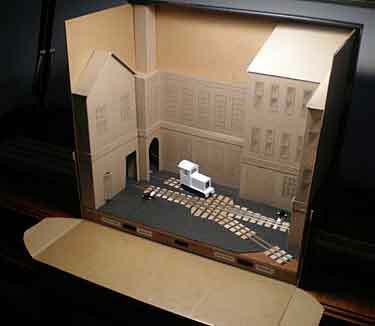 Note that most of the buildings forming this urban cluster are made from paper and card. 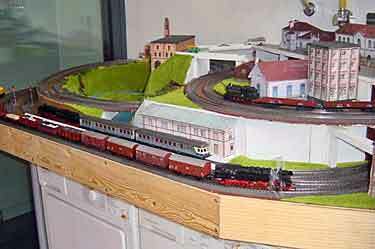 Trains and track are from Märklin. As you see, Henning has cleverly made use of the space available above the laundry equipement! 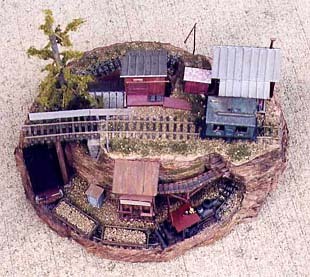 Frequent contributor MJ Idzerda, from London, Ontario, Canada, has used the classic oval plan in N scale to create this wonderfully scenic little layout, Birch Lake. 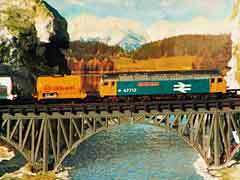 MJ derives great enjoyment from watching colorful CP trains gliding past through the splendid watery landscape (left below), occasionally pausing to shunt a few cars (right below). The line represents a CP Rail subdivision running through Ontario’s cottage country, Muskoka—”land of lakes”—an hour-and-half drive north from Toronto. Dimensions are 3x2ft (90x60cm). 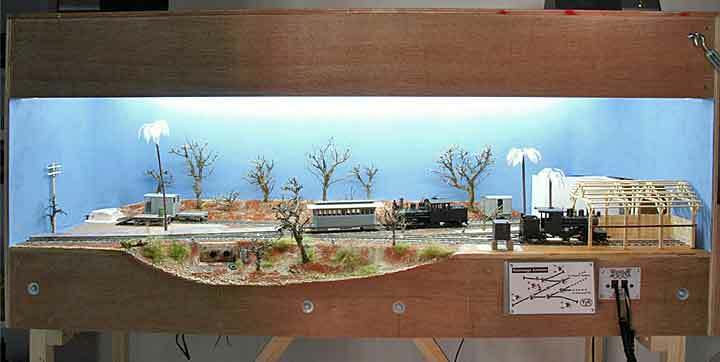 Following the same approach of watching trains glide through well-made landscape is Eric Jones, from Camberley, Surrey, England. 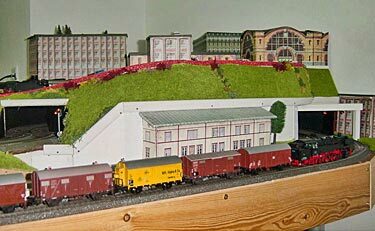 He made this scenic Z-scale layout some 20 years ago, and still enjoys watching trains pass by Glendale Falls Halt, cross the spectacular bridge and continue into the tunnel on the other side. Country modeled is near Inverness, Scotland. The second half, hidden behind the backscene, is ready for development any year now! 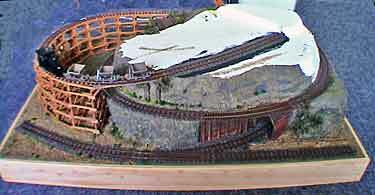 And a final example of using half the layout as a visible running area is illustrated by this N-scale switching district that connects behind the scenes to make an oval and provide a hidden fiddle yard. 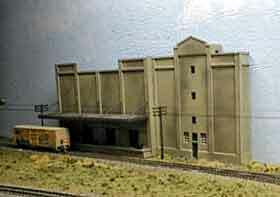 Michael Sorbo, from Hummelstown, Pennsylvania USA, designed Rowand Industrial RR, a 6x2ft (180x60cm) layout intended for exhibition at train shows. 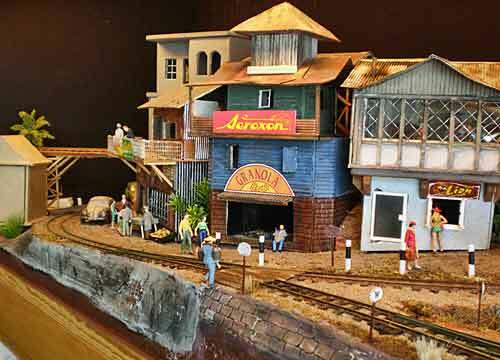 Alexander Kaczmarek, from Berlin, Germany, has published several views of his ongoing development of an Oe/On30 version of the Darjeeling Himalayan Railway in India… previously seen in Scrapbooks #53a, #63a, #74 and #81. Here are some recent shots of his continuing improvements. 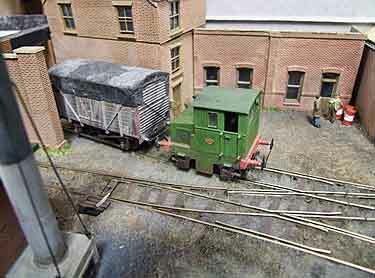 John Garaty’s dream of a remotely-controlled interface between forklift truck and narrow-gauge railway has reached maturity at last (see Scrapbook #80 for its beginnings). 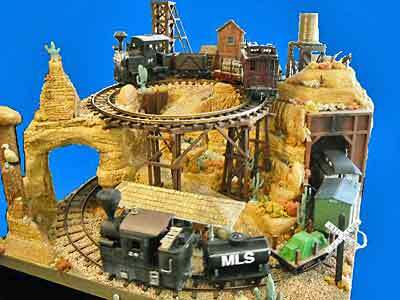 John, from Unanderra, Australia, unveiled the highly evolved final layout at a recent train show Down Under. 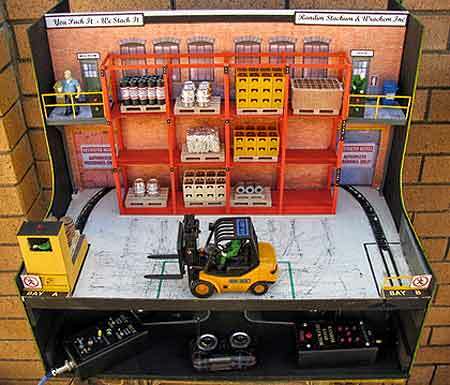 His summary: “Here is Randim Stackum & Wrackem Inc., Gn15 warehouse layout, in its final form with a scratchbuilt rail-mounted palletmover, 3-speed 1:20 scale radio-controlled forklift truck, scratchbuilt electronic Randim Load SELEKTOR, operational powered sliding doors, with layout sound including the forklift BEEP—all in a layout footprint of 600x450mm (24″x18″).” For a complete history of the evolution of this remarkable achievement, see his Gnatterbox thread. 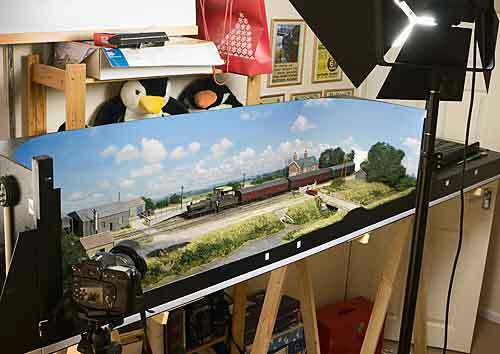 Melbridge Box Co., Phil Parker’s delightful boxfile layout to publicize the 2004 Double O Gauge Association Boxfile Challenge, is featured in the July 2009 Hornby magazine. See Scrapbook #18. Fabrice Fayolle, from Amiens, France, and his son, Joseph, show off their Aussie railwaymen’s garb at the premiere of Koonunga Junction in Froissy-Dompierre (in the Somme department, France) at the end of May. Joseph is the line’s photographer (see Scrapbook #81). 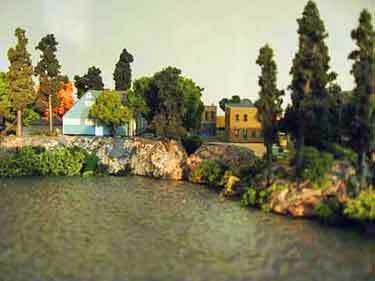 The two photos below show both ends of the first train through the junction, which is part of the (fictional) Yarra Island Railway located on an island in the Tasman Sea, off the coast of Australia. 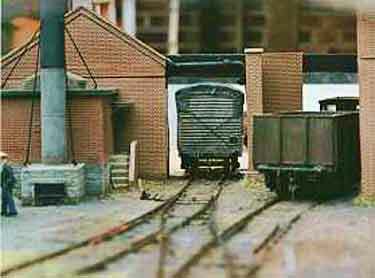 Fabrice’s layout models a prototype that is the farthest distance from home in our collection in Scrapbook #74. 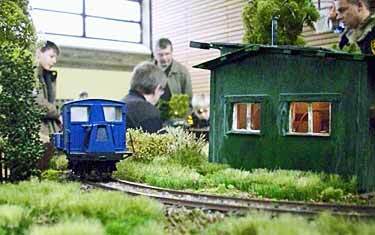 Michael Hanisch, from Hildesheim near Hanover, Germany, has continued to make additions and improvements to his Oe (On30) scale feldbahn railway, Asel, since we last visited in Scrapbook #83. 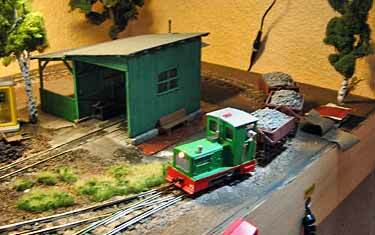 Newly added are a scratchbuilt freight platform and an excavator which swivels, along with a new figure or two. 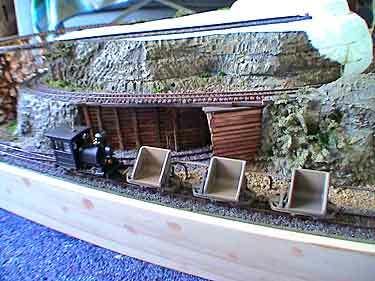 Things are looking good on the narrow gauge! 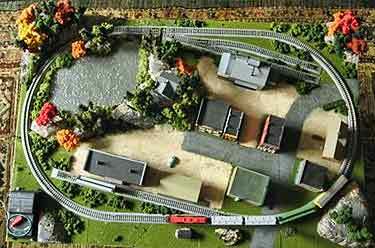 Both Murray McKenzie, from Wellington, New Zealand, and the children of all ages who view his layout, Sylvester Chocolate Mine, have added considerable enjoyment since our last views of the layout in Scrapbooks #75a and #80. 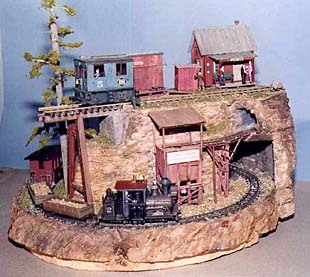 Because the main mission of the railway is to collect sweets from the chocolate mine atop the hill, and deliver them to eager hands waiting by the tip at the bottom, the electronics was often interrupted by clutching digits that triggered events out of sequence. 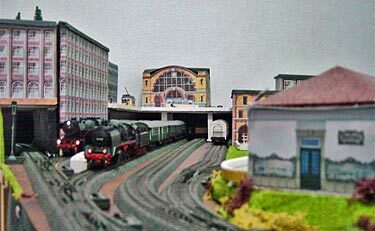 Murray has solved that problem by using photo interrupters that are all in protected positions inside the engine shed, chocolate factory, and gantry arm above the tipper bar. 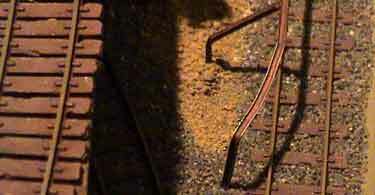 These photos show the current state of the layout, which is very popular at train shows in NZ. Notice that the orange trees planted in the rich volcanic ash atop the mountain are thriving, and provide an important ingredient to the chocolate factory’s famed “Jaffa” confection [inside joke]. Vital statistic: the trestle bridge has more than 750 separate pieces of timber with 48 tubes of superglue holding it together!